I am spending a few months in Göttingen as a Courant Distinguished Visiting Professor, and talking a bit to Laurent Bartholdi about rational functions — i.e. holomorphic maps from the Riemann sphere to itself. A rational function is determined (up to multiplication by a constant) by its zeroes and poles, and can therefore generically be put in the form where P and Q are polynomials of degree . If then is invertible, and is called a fractional linear transformation (or, sometimes, a Mobius transformation). The critical points are the zeroes of ; note that this is a polynomial of degree (not ) and the images of these points under are the critical values. Again, generically, there will be critical values; let’s call them . Precomposing with a fractional linear transformation will not change the set of critical values. If each is a transposition (i.e. in the generic case), then and we recover the fact that . Basic Question: Given a set of points in the Riemann sphere, and an irreducible representation satisfying , what are the coefficients of the rational function that they determine (up to precomposition by a fractional linear transformation)? Note that we would like to recover the coefficients numerically (i.e. as numbers with decimal points). And we are really interested in finding a practical algorithm, and then implementing it on computer. One obvious (and bad) idea is to just solve for the coefficients of P and Q subject to the constraint that the set of critical values is V (after normalizing so that three of the critical points are 0, 1 and infinity to remove the ambiguity of the precomposition). The problem is that the number of such solutions is exponential in the degree, and although Newton’s method will quickly find some solution, it is very, very unlikely to be the solution with the correct combinatorial data. Another idea — and one that leads to the point of this blog post — is to try to build the branched cover directly as a Riemann surface together with a holomorphic map with the correct critical values and combinatorics, and then uniformize it as to determine the numerical location of the zeros and poles. This sounds more promising, since there is an obvious way to build piecewise from copies of regions in glued together by very explicit maps. The problem is that (numerical) uniformization itself is very slow, at least if one wants any kind of accuracy. On the other hand, we do not need to know the values of the uniformization map everywhere, only the locations of the zeros and poles. So we can try to ask for a fast and approximate method of uniformization which gives sufficiently accurate values of these numbers, that they can then be adjusted quickly to very accurate values by Newton’s method. One potential idea is to use the method of circle packing. 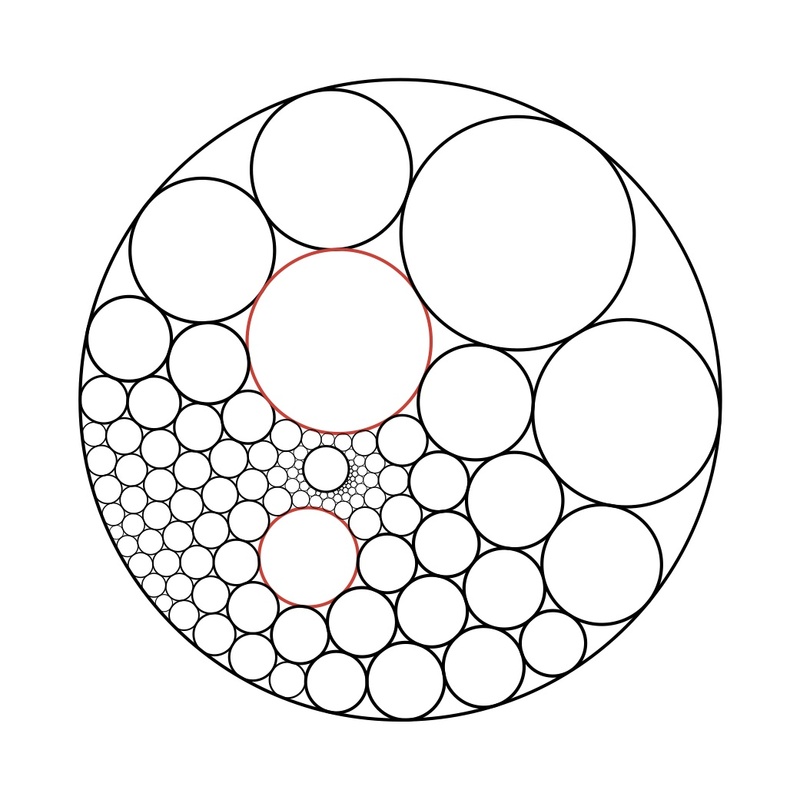 A circle packing is a (rigid) configuration of round circles with disjoint interiors and prescribed combinatorial pattern of tangencies. Abstractly, the circle packing determines a triangulation, with one vertex for each circle, one edge for each tangency, and one triangle for each triple of mutually tangent circles. Implicitly, by using the term “round circle”, the domain in which the circles are packed should be a Riemann surface together with a complex projective structure; for example, the Riemann sphere, or the Euclidean or hyperbolic planes. Given a projective surface and a triangulation satisfying mild topological conditions, such a circle packing exists and is unique; this is known as the Circle Packing Theorem (aka the Koebe-Andreev-Thurston theorem). One can also solve for configurations of circles intersecting at prescribed angles; for instance, one can look for a configuration of round circles with prescribed combinatorics, and meeting always at right angles. Such a configuration in the Riemann sphere can be interpreted as the boundaries of a collection of geodesic planes in hyperbolic 3-space meeting in right angles, and cutting out a compact right-angled polyhedron. The existence of such a polyhedron is the base step in Thurston’s inductive proof of geometrization for Haken 3-manifolds. One can also think of the circle packing as a discrete version of a conformal structure; at a talk at the conference in 1985 celebrating de Branges’ proof of the Bieberbach conjecture, Thurston proposed using circle packings to approximate conformal mappings. 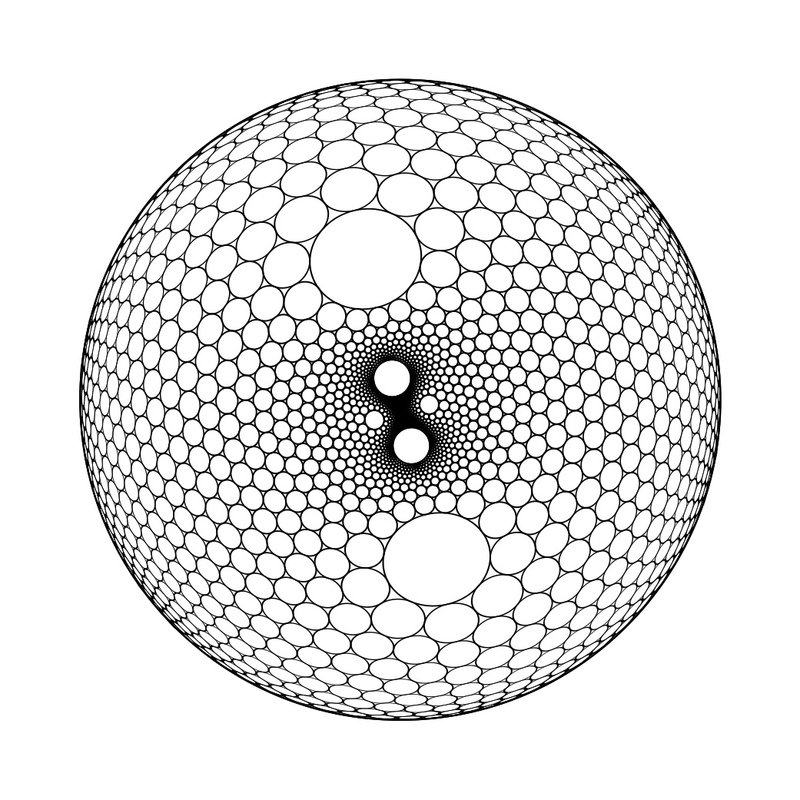 One starts with a region U in the complex plane, and packs it nearly tightly with a hexagonal packing of small round circles. Together with the boundary of U one obtains a topological circle packing; the round circle packing with the same combinatorics can be thought of as a packing of the unit disk. 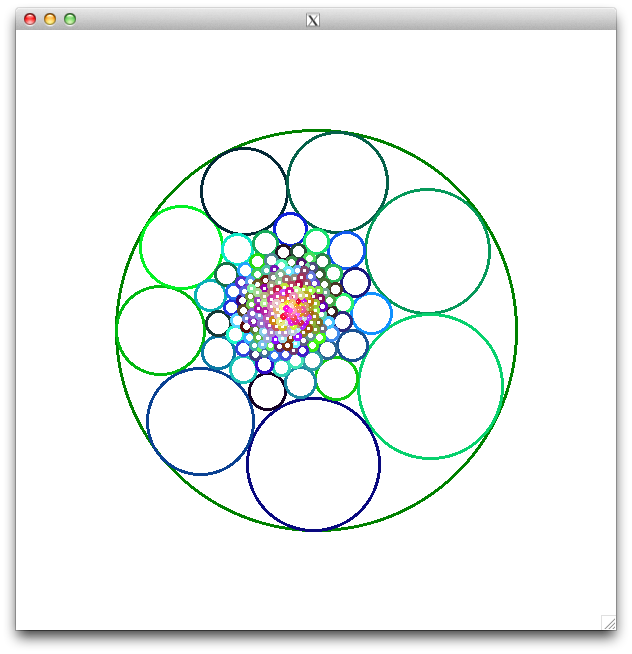 One therefore obtains a coarse “map” from U to the disk, taking each round circle in the packing to a round circle in the disk, and one should think of this as a discrete version of a conformal map. As the mesh size goes to zero, Thurston conjectured these maps should converge to the uniformizing map. This conjecture was proved by Rodin-Sullivan. In the context of our Basic Question we can try to find our desired rational map as follows. Starting with the collection of points V in the Riemann sphere, we build an (almost) round circle packing in such a way that one of the centers is at 0 and infinity and at each point of V. One should probably choose the mesh size quite small near these special points, since the derivative of is going to blow up near V. This determines a topological graph (the 1-skeleton of the triangulation described above). 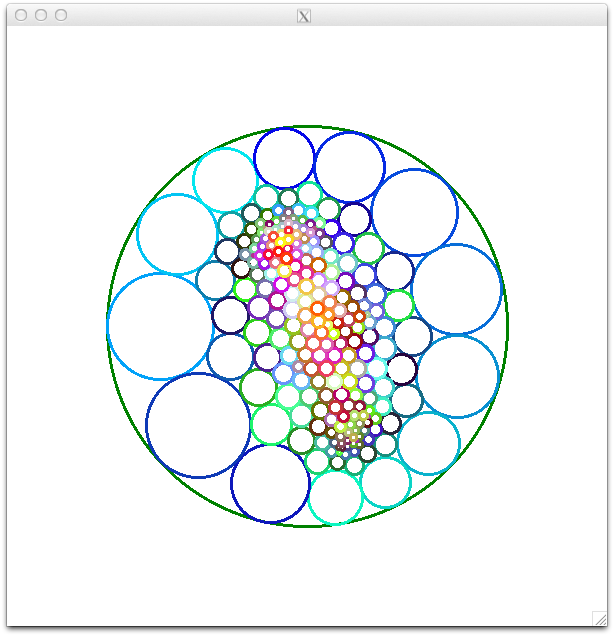 The branching data defines a new graph in an obvious way, and we can find the circle packing associated to that graph. The “preimages” of 0 and infinity are given as the centers of d circles in this new circle packing, and we can take these as our approximate zeros and poles for . 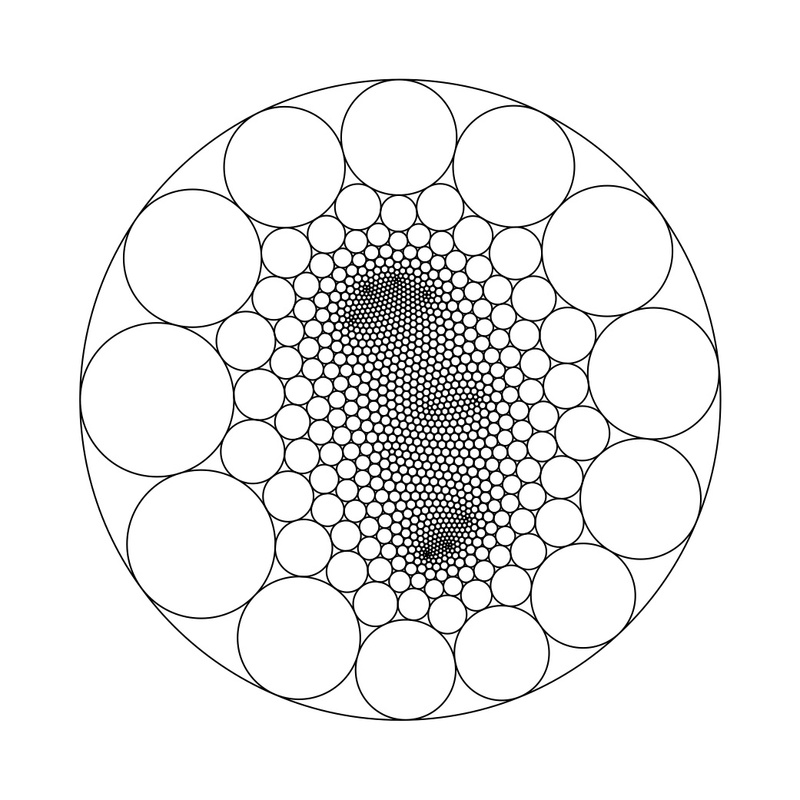 Anyway, this is all preamble to explaining that I wrote a little code to perform circle packing with prescribed combinatorial data, and in case I don’t do anything else with it (which is quite likely) I thought it might be amusing to post the code and some of the pictures it produces. 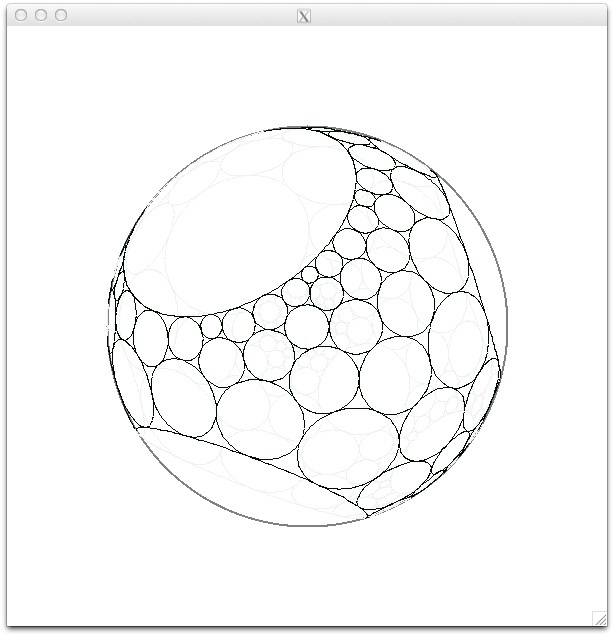 Note that very sophisticated and highly optimized code for circle packing is already available from many other places; for example, Ken Stephenson has an amazing collection of resources (both theoretical and computational) on his website. Download the source as a zip file, then unzip and type “make” to make. The program is written in C++, and outputs graphics to the screen using Xlib, and to an .eps file. It can either be run interactively (without an argument) or non-interactively, taking a file name (containing a topological circle packing) as a parameter. 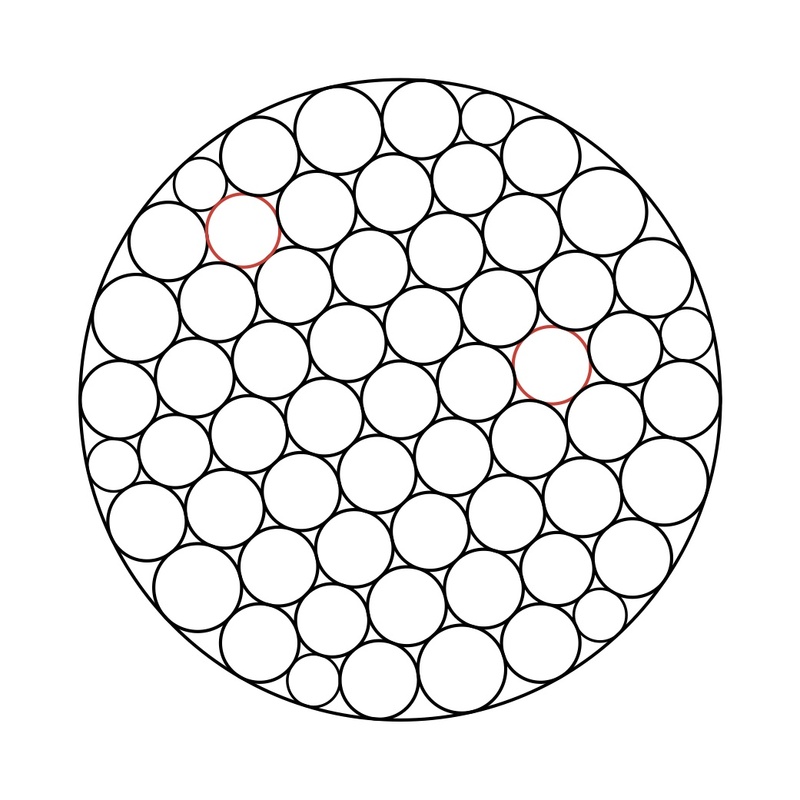 initial radius of vertex n-1. By convention, vertex 0 is the “outer” circle (centered at infinity). The program doesn’t check that the adjacency data that it is given is consistent, or that it gives rise to a topological sphere. If you try this out, please let me know what you think could be improved or fixed. Feel free to modify or change the code however you like (subject to the usual GPL license conditions). A wishlist would include to add the functionality I sketched above, i.e. to find approximate rational maps with prescribed critical values and branching data; any reader with some time on their hands is warmly invited to do this! This entry was posted in Complex analysis, Visualization and tagged circle packing, rational maps. Bookmark the permalink. You should put the code on GitHub! It’s pretty easy to use. It would be easier for people to see and communicate about any changes that way (and to collaborate on making them, too), and it would give the code more visibility. Dear Chris – thanks for the suggestion, I’ll check GitHub out. This sort of clever work and exposure! Keep up the superb works guys I’ve incorporated you guys to my blogroll. I tried your algorithm for some simple examples, but it gave no out output, meaning it didn’t stop. Does it work only only for hexgonal circle configurations?